By reviewing the key features of the business game, you’ll discover how SimVenture Classic covers nearly all areas of business and much more. Easily accessible help and advice is provided in many forms within the technology. And there’s video and interactive media, written guidance and ‘How to’ notes. Other features such as ‘Multiple difficulty levels’, ‘Tutor alerts’ and ‘Random events’ allow the software to be adjusted to suit different contexts, abilities and user needs. 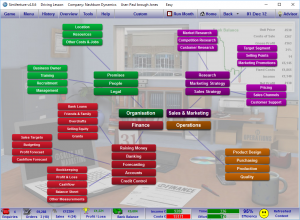 To find out more about the key features of the business simulation game, access a free instant download demo copy of the business game by clicking the button below. The demo copy does not expire and allows you to run a virtual company for up to 6 simulated months.